My husband has always told me “If you absolutely love something–BUY IT–because it will not be there when you get back.” Truer words have never been spoken. At events like these, one-of-a-kind items will be gone in a flash with all the shopping competition that is out there. If you fall in love at first sight and KNOW that you will love this piece in your home, then you should buy it. You’ll find a spot for all the treasures that you love. If you have any doubt at all about the piece or if you really need to buy it, then you might can walk away from it and see if it’s still there later. I listen to my gut and try to be smart about impulse shopping, but when you see a great deal that you know you’ll love, buy it. I am still suffering from non-buyers remorse over several amazing deals that I have walked away from over the years. I would list them here but it would just make me angry since I DON’T OWN THEM. I was too wishy-washy to pull the trigger and buy it when I saw it. Don’t be wishy-washy. Know your style, and trust yourself enough to be able to know when to pull the trigger. Here is an example of something I did buy for love. I instantly fell for this little vintage heater that I spotted at a thrift store. I had no clue what I was going to do with it, but I knew that it was a unique piece that likely wouldn’t be there later if I passed it up. I haggled with the store owner, and got him down to just $35.00 for this beautiful, unique piece. 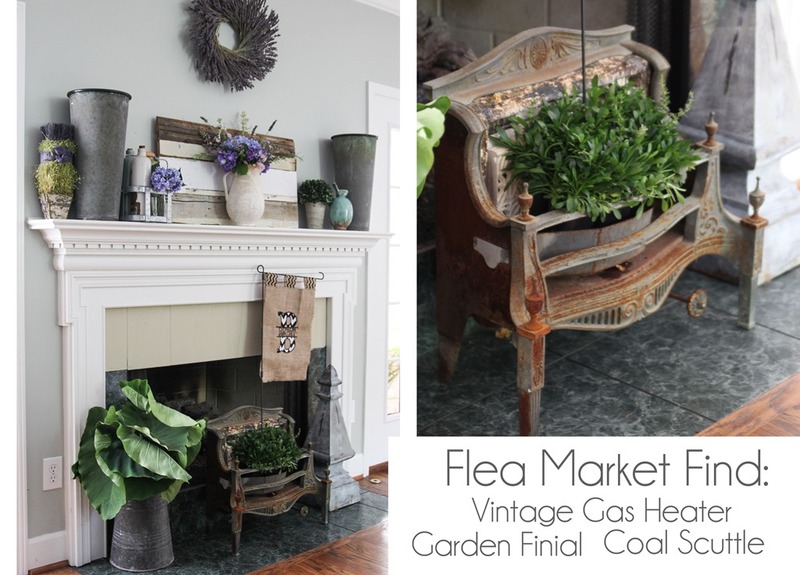 I took it home and used it as a planter on my summer mantel last year. 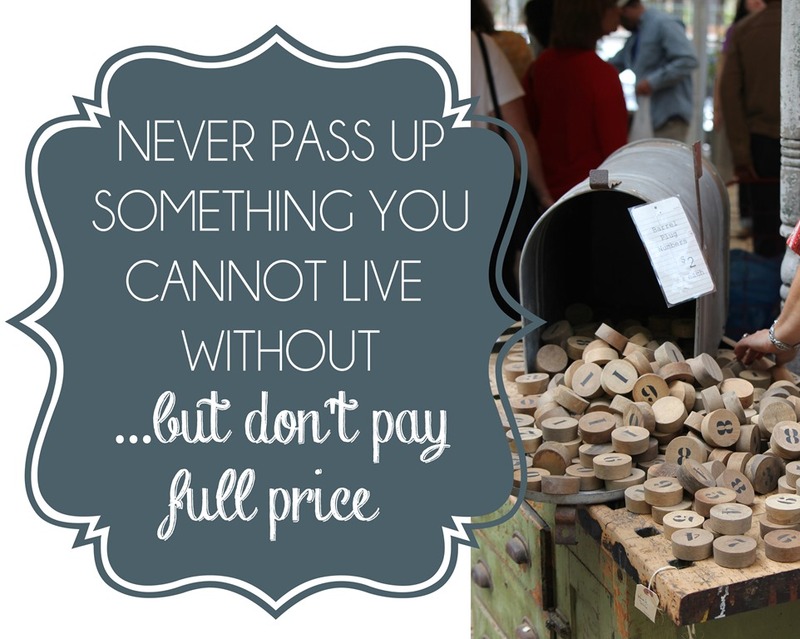 And speaking of haggling… that brings me to my next point… Click next to read on. That was one of the most entertaining posts to read on a Monday morning! I couldn’t wait to hit the next arrow to see what came of the little cat fight over the beehive. 🙂 It can get quite intense! We too played the haggling game in other countries. I can remember being in Cancun and the vendors would always wave us in with a “come see my store”. It sure was fun! Now, I have concrete tools to use to get the best price for what I truly love! And… it is good to know that I am not the only one who uses the word schmuck. Ha! I love this post! Great tips. I always run out of room in my car! LOL. Great tips, Beth! I haven’t been to a good fair in a LONG time! Thanks for sharing your words of wisdom with us! I love your stories, advice and especially the pictures! Ah the sweet victory of scoring a deal! 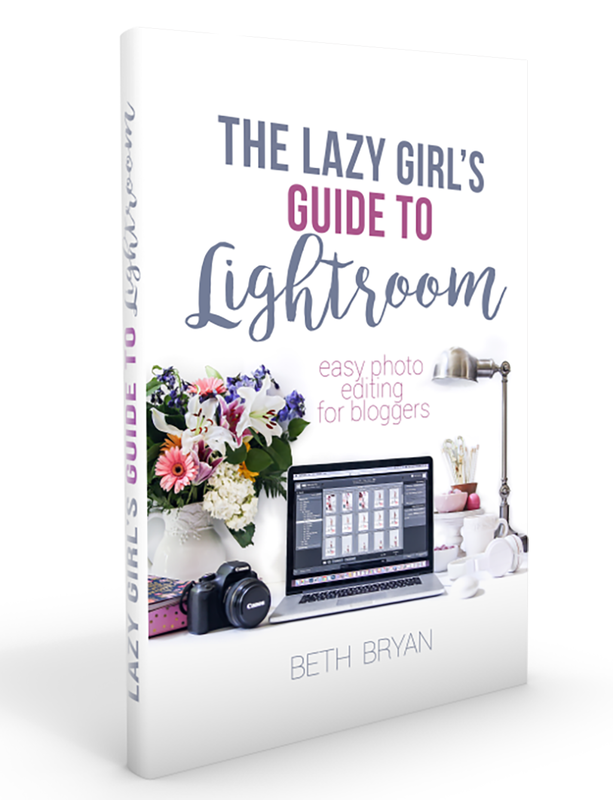 Great photos and tips Beth!! Great tips Beth! I have a hard time haggling with people – probably a lot because I have had my own booth and know what it’s like to try to make some money while at the same time selling things and making the customer happy too! I’m so ready for the garage sale season here – I’m just itching to get out there and dig for treasure! Great article! Yes, antiques dealers almost always have some wiggle room, but I have to throw in that us vendors who are selling as artists most often do not “haggle” at shows. Our items are handmade and priced so that we can make a fair wage, and many artists are already well underpriced. We love when shoppers value our work and understand that our prices are set to be fair to everyone. As Karan said before, I don’t mind if people ask (hey, you never know!) if that’s my “best price”, but I do expect that my first response is respected and hope that customers can find the value in having a one of a kind handmade piece. Can’t wait till the next Country Living Fair! Beth — okay, I read this was a Southern accent and it was hilarious! I remember how scared you were before doing this event and how proud you were of yourself for meeting and BEATING your fears head-on. I was visiting an Atlanta friend when the 2012 CL fair was on and we had a blast, even without spending much money. I love your style. You have made a very nice generic house a very interesting home. I love to take something and make it my own with design on the cheap as well. I love putting things together and see what I can make for seasonal and holiday decor. I couldn’t agree more! I am about to participate in my first craft fair. I crochet dress up hats and have an established etsy shop. My craft fair prices are already going to be lower than my etsy prices. It kind of made my stomach turn reading about taking 35% or more off the listed price as a haggling price. That is a bit offensive to me since it takes a lot of work to make handmade items. Also, keep in mind that vendors have to pay to be apart of such fairs. I hear you loud and clear, Sarah! I have been meaning to get back to this post and edit it so it’s more reasonable. What do you think is a good place to start negotiating? Do you ever haggle with your customers? As a customer I typically will ask if that is someone’s best price on a piece (it’s the yard-saler in me, can’t help it). Do you think it depends on the type of vendor booth? If it’s a bunch of old junky furniture that I’ve seen sitting in the same booth all weekend I don’t mind asking off at all, but if it’s a handmade item I typically wouldn’t expect it to be discounted that much. I’m going to rework the post and I’d love to hear your feedback! Hi every one, here every one is sharing such familiarity, thus it’s nice to read this webpage, and I used to visit this web site everyday.